The file handler serves files from its document root. No more, no less. By default it will use an internal I/O cache to improve the server performance. If you don’t want to use it with a directory just unset it using this parameter. 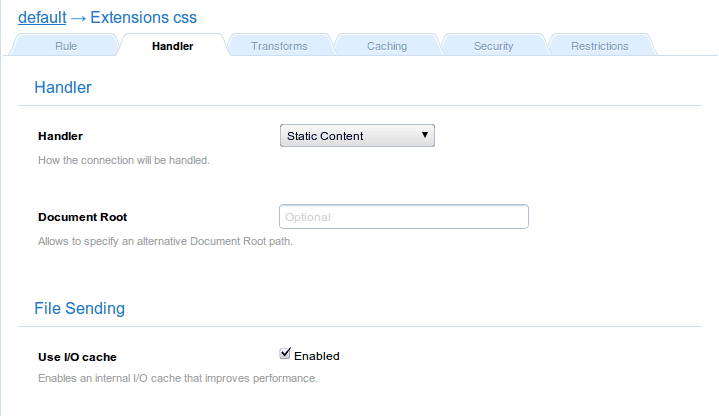 It is a good idea to disable to I/O cache if the content of the directory changes often. Lets imagine your virtual server DocumentRoot points to /var/www. No custom Document Root will fall back to the default one defined for the virtual server. This is a simple example that will make Cherokee able of serving each CSS file under /var/www or any subdirectory with the IO/cache setting enabled. This would only not apply if a final rule with higher priority specified otherwise.